Kabel Deutschland, Germany's largest cable provider, claims to have broken Internet speed records yesterday. While besting existing network throughput records seems to be a frequent occurrence, Kabel Deutschland's 4.7Gbps demonstration utilized standards, technology and infrastructure that already commonly exist. Arris, the manufacturer of modems used by Kabel Deutschland, was proud to announce the cable provider's achievement in this press release. "This demonstrates that today's HFC plant has the capacity to deliver a full IP video load, and that the entire HFC plant can be converted into one or more enormous pipes to meet future consumer bandwidth demands, using current technology and networks," noted Tom Cloonan, ARRIS CTO, Network Solutions. "We congratulate Kabel Deutschland on pushing through existing barriers to deliver their customers the services of tomorrow, today." The enviable speed was achieved at a school in Schwerin, Germany with a local infrastructure comprised of both optical fiber and coaxial cable. 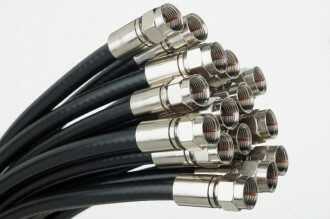 Although the facility relies mostly on coaxial cable, it is worth mentioning the school's HFC (hybrid fiber-coax) plant had recently been upgraded to 862MHz, the standard cut-off point for high-end coax. To reach 4.7Gbps, Kabel Deutschland bonded twelve DOCSIS 3.0 Arris Touchstone CM820 cable modems together. Network bonding is a method of combining multiple network links into a single, logical link. Each modem would aggregate eight data channels at 8MHz per channel adding up to potentially 768MHz of channel bandwidth, a figure very close to the network's physical limits. As an aside, unlike Europe's DOCSIS (or "EuroDOCSIS") which operates with 8MHz channels, DOCSIS in the U.S. utilizes 6MHz channels due to differences between PAL and ATSC standards. Narrower channels means less bandwidth per stream, so it is interesting to note that the same demonstration would have likely been more difficult and costly in the U.S. if utilizing the same technologies. Kabel Deutschland's CTO, Lorenz Glatz, offered some perspective on what 4.7Gbps means to everyday web surfers.